A pot roast is a meat, typically beef, and vegetable dish prepared in one pot. A Crock-Pot makes cooking a pot roast simple as you can arrange the meat and vegetables and leave it to cook. The way you arrange a pot roast in a Crock-Pot will affect how evenly everything cooks and how the flavors meld. It should take you no more than five minutes to arrange a pot roast in a Crock-Pot. Coat the Crock-Pot in a thin layer of cooking spray to keep the meat and vegetables from sticking. Alternatively, you can line the bottom of the Crock-Pot with bacon to add flavor and prevent sticking. Layer the root vegetables, such as potatoes, carrots and turnips, into the Crock-Pot first. To help the root vegetables cook evenly and to save space in the Crock-Pot, you might want to cut them up into bite-sized pieces. Sprinkle seasonings such as sea salt, ground black pepper or thyme over the root vegetables. Place the meat atop the root vegetables in the center of the Crock-Pot. Shake it back and forth lightly to nestle it into the top layer of root vegetables. Sprinkle the meat with seasonings. Add any remaining ingredients such as onions, mushrooms or garlic atop the meat and add one last layer of seasonings. Pour the liquid, such as broth, gravy, sauce or water, into the Crock-Pot. 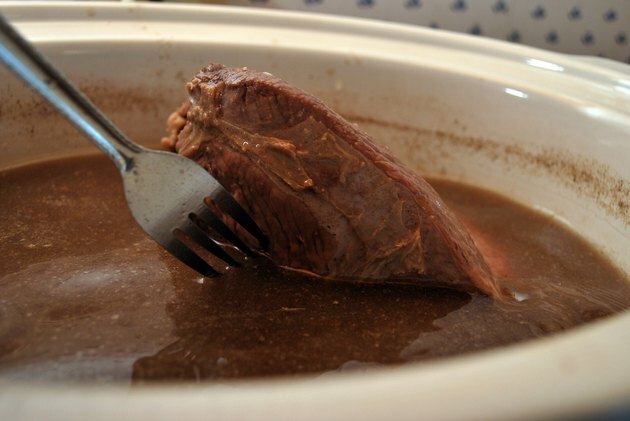 Ideally, there should be at least 4 inches of liquid to prevent the pot roast from drying out. Cover the Crock-Pot and cook the pot roast. If you do not have a cooking method in mind, set the Crock-Pot to high for four hours to roast the meat and vegetables. Reduce the heat to low and continue cooking the pot roast for up to 12 hours to ensure the meat is thoroughly cooked.